Dave Splash Dot Com: The Last Good Republican President? The Last Good Republican President? "We Republicans must hold the just balance and set ourselves as resolutely against improper corporate influence on the one hand as against demagogy and mob rule on the other." 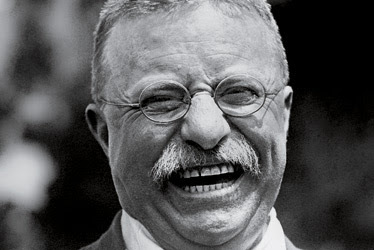 TR was indeed a great president, and not only because of his monopoly-busting policies. I think a lot of your fellow leftists would not much care for Teddy though when it came to his foreign policy and America first attitude. Oh, and you forgot the other great Republican president of the 20th century. The man responsible for bringing our economy out of the Carter abyss, winning the cold war, and placing America back on the pedestal as the greatest nation and a "shining city on the hill". The great Ronaldus Magnus! Nah, I'll take TR anyday. He was a Republican before the party went all nutty and extreme right wing. Reagan is all hype, and would be booted out of the current GOP for being too "moderate." You know those six times he raised taxes, and the government growing and all.